358 Marlborough is located on the south side of Marlborough, between Gloucester and Hereford, with 356 Marlborough to the east and 360 Marlborough to the west. 358 Marlborough was built in 1879-1880 by Vinal & Dodge, masons, for building contractor George Wheatland, Jr., one of eight contiguous houses (348-350-352-354-356-358-360-362 Marlborough) built in 1878-1880 for him. Click here for an index to the deeds for 358 Marlborough. 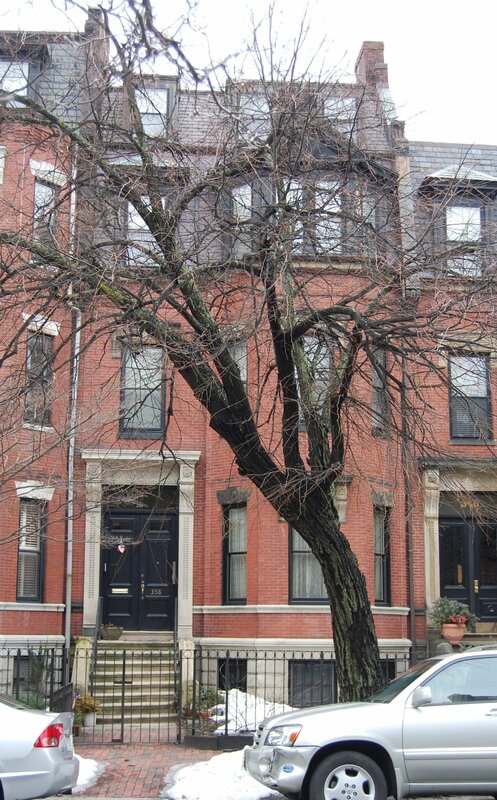 The original permit application for 358-360 Marlborough (one application for both houses) was submitted on September 22, 1879, by George Wheatland, Jr. 362 Marlborough probably was constructed at the same time (the original permit application is not included in the Building Department’s files). On May 1, 1880, when the houses were nearing completion, William D. Pickman and the estate of William P. Fay (who had died in March of 1879) transferred their two-thirds interest in 358-360-362 Marlborough to George Wheatland, Sr.
On May 31, 1880, 358 Marlborough was purchased from George Wheatland, Sr., by Jacob Wendell of New York City. The next day, on June 1, 1880, he transferred the property to his son, Barrett Wendell, who was married that day to Edith Greenough. Barrett Wendell was an assistant professor and, from 1898, full professor of English at Harvard. He was a noted lecturer and author of several books, including the Life of Cotton Mather. The Wendells raised their four children at 386 Marlborough: Barrett Wendell, Jr., Mary Barrett Wendell, William Greenough Wendell, and Edith Wendell. In the late 1890s or early 1900s, the Wendells remodeled 358 Marlborough to add an additional story. It is shown as a three story house on the 1898 Bromley map, but as a four story house on the 1902 map. Mary Wendell married in September of 1902 to Geoffrey Manlius Wheelock, and they lived with the Wendells at 358 Marlborough until about 1904, when they moved to Shanghai, China, where he was a ship broker. During the 1904-1905 winter season, the Wendells were living elsewhere and 358 Marlborough was the home of Frederick Harris Warner and his wife, Eleanor (Skinner) Warner. 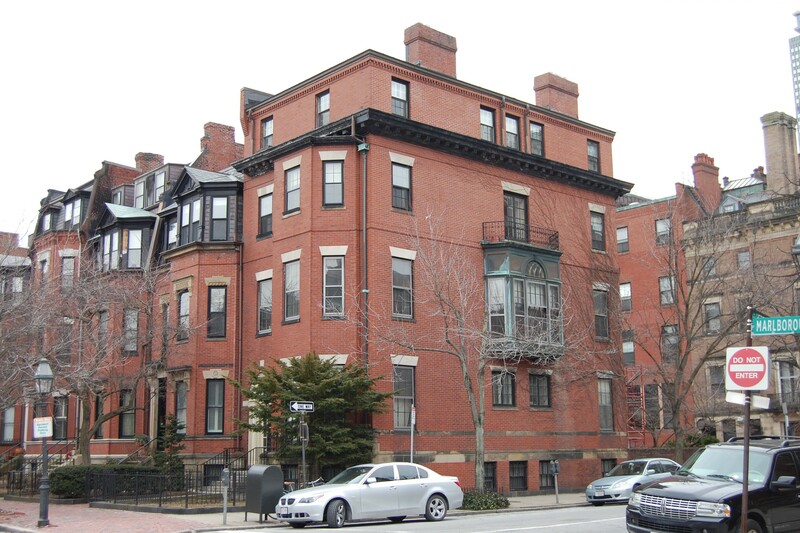 They previously had lived at 28 Bellevue in Dorchester, and by the 1905-1906 season had moved to 92 Bay State Road. By the 1905-1906 winter season, the Wendells were living at 358 Marlborough again. Barrett Wendell Jr., married in June of 1910 to Barbara Higginson. He was an investment banker They lived with his parents at 358 Marlborough during the 1910-1911 winter season, but moved soon thereafter to 265 Clarendon. Edith Wendell married in January of 1913 to Charles Devens Osborne. After their marriage, they lived in Auburn, New York, where he was a newspaper editor. In mid-1913, Barrett and Edith Wendell were joined at 358 Marlborough by their son, William Greenough Wendell, a trust company executive, who previously had lived in New York City. He married in July of 1915 to Ruth Appleton. After their marriage, they lived at 18 Charles River Square. Barrett Wendell died in February of 1921. Edith Wendell continued to live at 358 Marlborough until her death in October of 1938. She also maintained a home in Portsmouth, New Hampshire. 358 Marlborough was shown as vacant in the 1939 City Directory. On March 8, 1939, 358 Marlborough was purchased from Edith Wendell’s estate by real estate dealer Henry J. O’Meara. On March 23, 1939, 358 Marlborough was was purchased from Henry O’Meara by Harold Dewey Murray, a chauffeur, who operated it as a lodging house. He and his wife, Emma (Fitton) Murray, lived at 69 Weston in Roxbury. In December of 1939, they acquired 15 Gloucester, which they also operated as a lodging house. 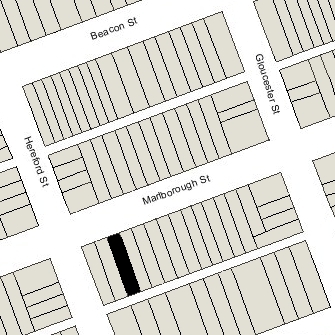 In the 1941 City Directory, Harold Murray was listed at 358 Marlborough and Emma was listed at 15 Gloucester. By 1942, they no longer owned either house and were once again living at 69 Weston in Roxbury. On November 12, 1941, H. Leon Sharmat foreclosed on a mortgage to Harold and Emma Murray and sold 358 Marlborough to Rebecca Silberman, treasurer of Warren-Stevens, Inc., real estate dealers. On December 22, 1941, she transferred the property to Warren-Stevens, Inc. In January of 1943, Warren-Stevens, Inc., filed for permission to legalize the property as a lodging house, which was its current use. The permit was denied because of insufficient egress. In April of 1943, it filed a new application providing for additional fire escapes, and the permit subsequently was approved. On January 8, 1945, 358 Marlborough was acquired from Warren-Stevens, Inc., by Albert A. Scanlan. On July 16, 1945, it eas acquired by Benedict Gerard Groder. He lived at 193 Beacon. On April 23, 1956, Gerald Bovee acquired 358 Marlborough from B. Gerard Groder. He continued to live there and operate it as a lodging house until the late 1970 and probably until his death in November of 1989. After Gerald Bovee’s death, 358 Marlborough became the property of Paul Anthony Hunt. He died in December of 1991, and the 358 Marlborough was inherited by William Arthur Punch. He and his wife, Camille M. (Caputo) Punch, made it their home and continued to operate it as a lodging house. On August 15, 2008, he transferred the property into both of their names. 358 Marlborough was assessed as an apartment building in 2015.